A place where modern culture and some of he world's most ancient architecture meet, the countries surrounding the Caspian Sea are full of wonder. This glimpse at the eastern and western shores of the Sea begins in Armenia in the city of Yerevan. It is here that our tour group meets and the adventure of a lifetime begins. After an overnight in a comfortable hotel, we journey to the Geghard Monastery, which dates back to the 4th century, and a 1st century Pagan temple. The Golden Eagle awaits for our scenic journey through Armenia, including a look at the gorgeous blue waters of Lake Sevan. There is one final stop in Armenia - Dilijan - before our train crosses the border of Georgia and arrives in Tbilisi. 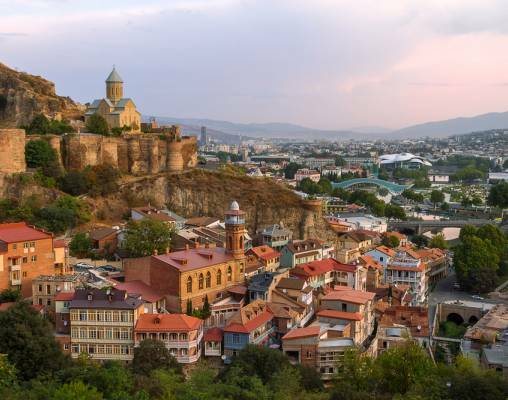 Deep history abounds in this city, and we take the time to explore here and in Telavi, Gori, Uplistsikhe Cave City and Mtskheta before crossing into Azerbaijan. 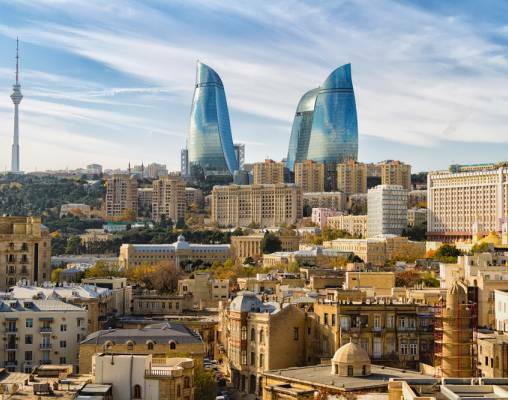 Baku is the first stop once we cross the border, and here, we spend two days exploring the city and its ancient structures, some of which date back to the 11th century. Ashgabat - the "Las Vegas of Kara Kum" - is next on the itinerary, then from here, we pass further into Turkmenistan to Darvaza. The final leg of this amazing journey is spent touring the counties of Uzbekistan and Kazakhstan. Stops at UNESCO World Heritage Sites, cities that date back as far as the 6th century, religious sites and other interesting expeditions highlight our time in Khiva, Bukhara, Samarkand, Tashkent and Almaty, the final destination of the Caspian Odyssey tour. 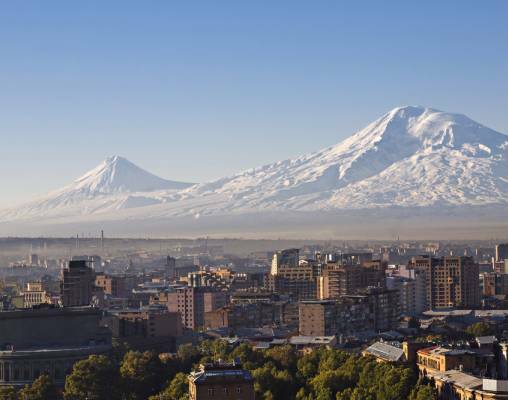 The Yerevan skyline is dominated by Mount Ararat in nearby Turkey, with its snow covered peak towering in the distance. Yerevan has a rich history and was occupied as early as 6,000 BC. The fortress of Erebuni was erected there in the 8th century BC. Seized by a succession of conquerors, the city later passed back and forth between the Turks and the Persians until 1827, when it was taken by Russia. It became the capital of Soviet Armenia in 1920 and following the demise of the Soviet Union, the capital of the new nation of Armenia. Our day's touring will take us 23 miles (37 km) out of Yerevan to the ancient Geghard Monastery. The beautiful monastery contains a number of churches and tombs, many of them cut into the rock. The complex of medieval architecture is set into a landscape of great natural beauty, surrounded by towering cliffs at the head of the Azat Valley. We'll also visit the 1st Century pagan temple of Garni, built to worship the Sun God Mitra. We'll explore the remains of an ancient fortress, palace and baths there. Back in Yerevan city we'll visit the Cascade giant stairway and inside it the Casfejian Museum of Modern Art. 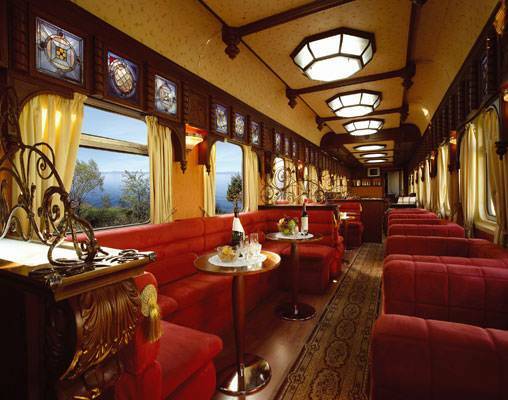 In the evening we board our Golden Eagle private train and start our rail adventure to Almaty. Our train takes a scenic route today around the stunning Lake Sevan and we make a short stop to walk to the beach for a photo opportunity. Along with Lake Van and Lake Urmia, Sevan was considered one of the three great lakes of the historical Armenian Kingdom, collectively referred to as the Seas of Armenia; it is the only one within the boundaries of today's Republic of Armenia. We'll continue to Dilijan to visit the nearby Monastery of Haghpat, built between the 10th and 14th centuries. Its beautiful location in dense wood in the gorges of two small mountain rivers make an atmospheric backdrop for St. Astvatsatsin Church, its most important building. We'll have an Armenian cognac reception at Avan Dzoraget Hotel on the Debed River, nestled among the forest-covered hills and rocky slopes of the Caucasus Mountains. 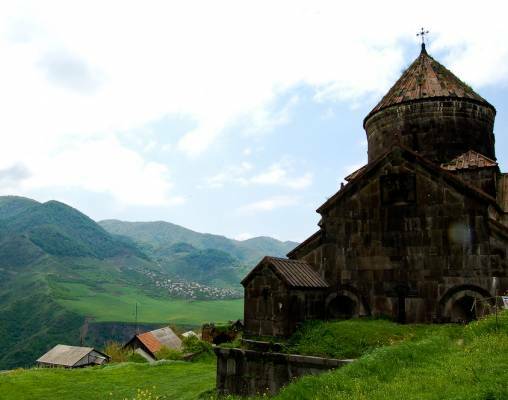 Today we explore the beautiful Kakheti region, which borders the Great Caucasus Mountain range. This region is known as a birthplace of Georgian viticulture and wine-making. We tour the Tsinandali country estate of the Alexandre Chavchavadze family with a marvellous garden, house-museum, park and winery dating back to the 19th century, located near Telavi, a couple of hours' drive from Tbilisi. 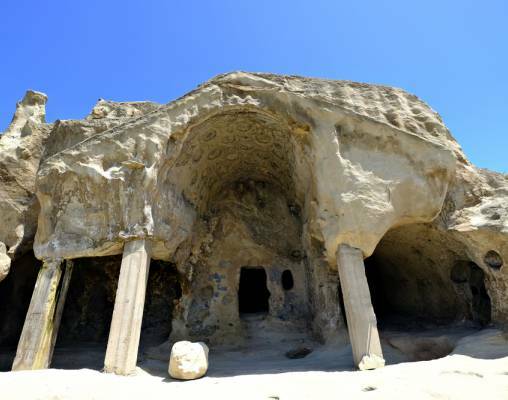 The famous cave city of Uplistsikhe dates from the 6th century BC and is first mentioned in the chronicles of the 1st century AD. Carved into rocky plateau we find huge echoing halls, meandering corridor-streets, chambers for pagan worship and even the remains of Georgia's oldest theatre, complete with auditorium, stage and orchestra pit. Like the other cave-towns of Georgia, it is rooted in the prehistoric traditions of the peoples of the Near East. On one side the fortress was protected by the Mtkvari and an almost vertical rock face, on the other, by powerful fortifications. Its strategic position on the approaches to Gori and, in particular, its strong defences made it possible to control the surrounding terrain. There were numerous attempts to destroy Uplistsikhe. Only in the 13th century, however, did the hordes of Genghis Khan's son Khulagu succeed in doing so, after capturing and destroying many fortresses in Transcaucasia with the help of siege machines. The 5,000 inhabitants of Uplistsikhe perished and life ended forever in the fortress. Late afternoon we visit the city of Mtskheta, Georgia's Old Capital. Due to its historical significance and numerous ancient monuments, Mtskheta became a UNESCO World Heritage Site in 1994. We stay at the five-star Four Seasons Baku for two nights, while our train is loaded on the ferry to cross the Caspian Sea. This morning we offer a Freedom of Choice tour to Gobustan Rock Art Cultural Landscape. Located 40 miles (64 km) from Baku on the west bank of the Caspian Sea, Gobustan is an outstanding archaeological site of more than 6,000 pre-historic rock engravings. The area also features the remains of inhabited caves, settlements and burials. This is followed by lunch overlooking the Caspian Sea. Returning to the city in the afternoon, you can choose to enjoy free time in the city or visit a local theatre. Dinner will be held in a traditional local restaurant this evening. NB: Early morning our train is loaded onto a cargo ferry for a 12-14 hour crossing of the Caspian Sea from Baku to the town of Turkmenbashi. Formerly known as Krasnovodsk, it is the western terminus of oil and natural gas pipelines and of the Trans-Caspian Railway, which links the Caspian region with central Asia. Following breakfast we take a morning flight to Ashgabat. The capital of Turkmenistan is known as the ‘Las Vegas of the Kara Kum'. 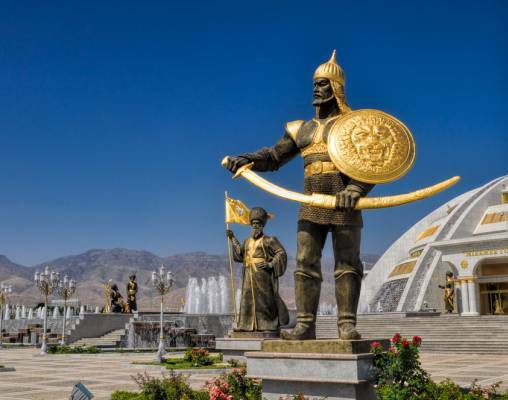 Situated between the Kara Kum desert and the Kopet Dag mountain range, Ashgabat is a relatively modern city built upon the ruins of the Silk Road city of Konjikala and the Soviet city built after the devastating earthquake of 1948. The city's extravagant fountains, golden domes and towering modern buildings appear strangely incongruous in this desert setting. Highlights on our visit include a trip to the National Museum and Kipchak Mosque. Stay overnight in Oguzkent Sofitel hotel (or similar). The Golden Eagle makes a brief scheduled stop at Ichoguz, where we have the option to leave the train and make a short journey to Darvaza's famous burning gas crater, a spectacular sight best seen at night. Located in the middle of the Kara Kum desert where the area is rich in natural gas, the 70 metre-wide crater is known by the locals as the ‘Door to Hell' and has been burning for over 40 years. A unique experience that is not to be missed. Bukhara is quite simply outstanding. Like Khiva, UNESCO sponsored the renovation of much of the city for its 2,500th anniversary in 1999. The most enjoyable aspect of this city is to just immerse oneself in the atmosphere of this unique and ancient city and re-live some of its fascinating history at the crossroads of Asia. The main highlight of this wonderful tour is a visit to The Ark, a fortified residence of the Emirs of Bukhara - the despotic and ruthless leaders who ruled until Soviet times. We then travel out of the city to experience the Emir's enchantingly named, ‘Palace of the Moon and Stars'. Tashkent is the capital city of Uzbekistan and we spend time touring this modern Soviet-style city which was rebuilt following the devastating earthquake of 1966. Our tour of the city includes the Old Town, where traditional homes and religious buildings line the narrow streets and here in a small library we'll be privileged to see one of Islam's most sacred relics - the world's oldest Koran. This is followed by a visit to the Railway Museum and the Museum of Applied Arts. This evening we enjoy our Farewell Dinner onboard the Golden Eagle as we head overnight to our final destination of Almaty. Following breakfast you will be transferred to Almaty Airport for your onward flight. Why not extend your stay in Almaty with additional nights to explore more of the city and surrounding region at your leisure? Enter your details below if you would like to be notified when 2021 dates and prices are available for The Golden Eagle - Caspian Odyssey.